Over the years I have met many people in my business dealings but few have been as lucky as my meeting Jack. I met Jack about a year and a half ago and after talking a bit we found out that we have much in common, especially hunting. I also found out that Jacks family owns a ranch on the Powder River in south/east Montana. To top it off he invited me to hunt with them!!! Some have heard this before but my shoulders are bone on bone and I have been told to put down the bow. Jack is a rifle hunter but was very interested in my use of a bow. To shorten my account a bit I received a land owners permit for rifle deer but I had to put in for the draw on antelope, When I was filing out the form I checked the box that said rifle as my first choice but the archery as my second choice. I truly don’t remember doing this as a conscious choice but I did??? Well when the results came out I did not get my rifle but, drew the archery!!! Now I had to figure out how to get just a little more time out of these shoulders and be able to shoot if the opportunity came around. I have pretty much sold off my traditional bows but their draw weights were too much for me anyway. I drifted through the classifieds and found a 40# bow built by George Perez of Rainy Day Bows….. I started by tuning an arrow and broadhead combo. That took more time than I thought as my shooting sessions were every other day and 10 to 20 arrows MAX before the shoulders started screaming. Over the next month I shot 5 to 10 arrows a day from that bow. I took my time and focused on form and accuracy and felt satisfied I was good to go. Jack’s dad set up a pop up ground blind on one of their properties that had a windmill water source. The set up worked perfect. The windmill set on the edge of a creek bank. The water went into tanks and the overflow collected in the bottom of the creek in another small pool. I entered the blind about a half hour before sun up and did not see a single animal until 1:30 or so. I looked to the bottom of the valley and saw three does coming over the ridge about a mile or so away. I did not see a buck until a few minutes latter but then he appeared. It happened so fast after that my head was spinning. The does came in high above me on the opposite side of the creek and were very cautious. The buck on the other hand sprinted full throttle and skidded to a stop at about 18/20 yards from the pool at the bottom of the creek bed. I slowly got into position started to full draw and something spooked the does and they bolted up the hill. The buck bolted and fallowed but stopped at what I latter paced off as 26 yards. I came to full draw, picked a spot and watched the arrow burry itself in the buck. I can’t speak for others but the most nerving part is watching an animal hit run off and hearing fall, fall, fall like a drum beating through my brain. The buck with both his lung perforated and his heart sliced ran 80/100 yards up hill did a back flip and came to a stop. I was shaking but elated at the same time…………. The arrow had gone completely through him and fallen out on the ground where he lay. This is probably my last traditional hero shot but if it is I couldn’t be more pleased. He is at the taxidermist now and though it was not my reason for shooting him. The taxidermist said he will measure in the mid 70’s and he is my biggest Speed Goat with any weapon. Thank you Jack for inviting me to share your slice of Paradise……..
That is a superb Goat........congrats and thanks for sharing!! Congrats on your speed goat! Way to persevere ! Nice goat and story!! very nice, sir. That is an Awesome speed goat. 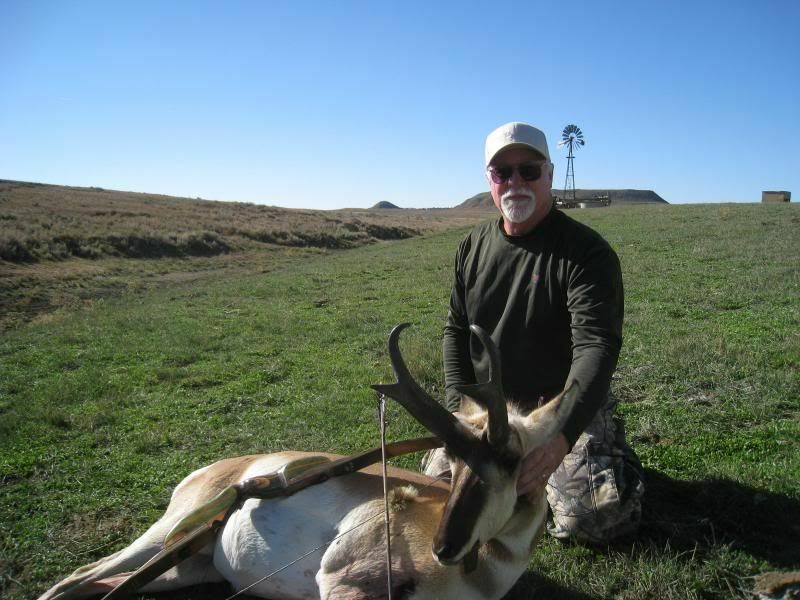 I have shot some trad pronghorns, and let me tell ya, that is a hell of a buck!!! I was very lucky to get a chance at such a great animal. This was the tail end of the rifle season and the animals were very spooky to say the least.